Oh it was SO nice to have 4 days off , no school no work just time spent together bringing in the holiday season. It was just the mini vacation I needed. I have decided this will be our last week of Norse Mythology till after the New Year, instead we will be doing a handwork block while counting down the days till Christmas. This year ,as I have said before, I decided to bring a more relaxed approach to our school year. I am tired of beating myself up trying to do everything in a school day. I find myself upset by the fact we are not doing enough handwork and even stressed at how other people find time to do all those lovely handwork projects I see on-line. Then it hit me why not do a handwork block like we do a math or language arts block? And what not a better time then over the holidays? Like this wonderful blog post “I am learning to let go” of what I think a Waldorf homeschool should look like.I hope to spend time during this block “decompressing” and really meditating on what is best for my family. All three above can be found here . Little Drummer Boy Which Miss Sky found (all on her own)the tune to play along on her penny whistle. This months memory poem The Time Draws Near by Alfred Lord Tennyson. Today’s main lesson was all about Thor and Sif. Miss Sky came up with her summary and made her picture in her MLB. We marched them out then she found the hidden words inside the words and copied them twice in her MLB, printed once and once in cursive. 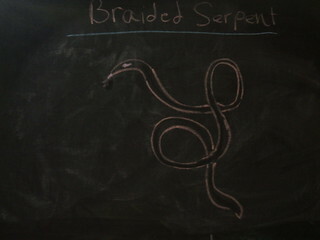 For form drawing , getting my idea from here, (there are lots of form drawing ideas here under form drawing)I made a braided serpent to go with our story. She practiced it by tracing the form on the board with her right then left finger finding its rhythm. For reading Miss Sky read chapter 1 of The Best Christmas Pageant Ever by Barbara Robinson and I read Christmas in the Big Woods from the Little House Christmas Treasury by Laura Ingalls Wilder. Man it sure turned cold fast I mean I just had my sheets hanging outside yesterday and this morning woke up to sleet. Guess we will just have to fire up the wood stove (darn). I have found myself back in the kitchen, we have made peace with each other this week and it feels good to be using my hands again to bring nourishment to my family. I have been looking at the same pumpkin for weeks (Halloween) why roast it there will be no pumpkin pie this year but I found a great website that has changed my tune and a crustless pumpkin pie recipe. This gluten-free journey has not been an easy one for me and maybe you have noticed there has not been any baking days with The Little’s lately. Do I even dare to admit cereal (rice and corn chex) has made it back on our breakfast menu, but tomorrow is Thanksgiving and my family is counting on me. Yesterday we finished our story An Old Fashioned Thanksgiving and I find myself thinking just how much things have changed since then. How days before Thanksgiving women found themselves busily in the kitchen working to prepare for the weeks festivities now not only can you have Thanksgiving catered to you but we find ourselves having to make crustless pies. Well enough of my whining , we have managed to fit in some schoolwork so we can kick back and enjoy our 4 day weekend with loved ones. After doing our Thanksgiving circle for the last time we finished the week out talking about Balder and Hod and Miss Sky came up with a summary from what she already knows about them. Even though this story is different (my own thoughts since I know what happens in the end) I have found it a bit similar to the Bible story of Cain and Able or I should say it reminds me of the story. Balder being the favorite most beautiful and gentle of all the gods, and Hod being blind ruling the dark hours of the night. Miss Sky copied her summary and made her picture in her MLB. For story Miss Sky finished her book The Courage Of Sarah Noble and has been independently reading If You Lived in Colonial Times by Ann McGovern. When out at JoAnne’s fabrics I happen to find some material in the scrap bin to help Miss Sky practice cross stitching. She was really excited to start to work on her “sampler”. Little Sis worked on her paper “quilt work” There is just something about doing handwork on a cold day in front of the fire. Wishing everyone A Very Happy Thanksgiving ! Well being that this will be a short week due to the holiday and all its preparations Miss Sky will not have spelling , vocabulary, or form drawing. 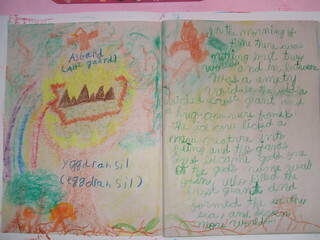 We will however still be working from last weeks Norse creation story continuing in her book of gods and goddesses. Today was all about Frigg, but first we had a short warm up with movement time. We our focusing on our Thanksgiving songs and fingerplays this week only. Most of the Thanksgiving songs that don’t have a link already can be found here. Sticking with drawing our own pictures this block Miss Sky first told me what she remembers about Frigg from last weeks story and the only thing I added was how she made every object of nature take an oath not to harm her favorite son Balder. She copied her summary in her MLB then we drew our picture. For reading Miss Sky read the first 3 chapters of The Courage of Sarah Noble by Alice Dalgliesh and I read the first half of An Old Fashioned Thanksgiving by Louisa May Alcott. This is another of our most favorite fall stories and could not imagine Thanksgiving without it. This story brings on so much imaginative play and can be found for free here. 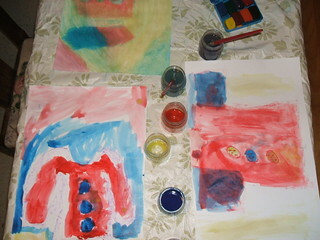 I am finishing up Steiner’s lecture A Child’s Changing Consciousness and listened to lecture 6 last night. It is so ironic that this lecture is all about gratefulness and love because that is what today’s theme was for Little Sis’s main lesson. This was just the lecture I needed to hear right before we head into the holidays. There is so much in this lecture but my favorite quote has to be “Every education is self-education”. Okay I can hear all you homeschooling Mama’s out there going um YEAH, but to think that someone said this like 100 years ago astonishes me. I know sometimes I sound like an infomercial for Waldorf education but this is one of many reasons why I chose this path of education for my children. Not pouring in facts and testing to see what they remembered just to pass the test but awaking knowledge deep down from within. To instill in them the tools needed to educate themselves and then to get out-of-the-way :). Yesterday Miss Sky told me all what she learned about Odin and I wrote her summary on the board for her to copy in her MLB then we went into the kitchen to draw our interpretation of what he looked like. I enjoyed this so much and feel like she really grasped her own image of who Odin was and think we will do this more even after the block is done. Today was all about Little Sis. I wanted to bring a story to Little Sis that brought next weeks festivities alive without “explaining ” the history behind Thanksgiving . I mean she doesn’t know what a pilgrim is. So I thought I would focus on the “thankfulness” part instead. I found a lovely story called The Thankful Coat here. So after Miss Sky’s spelling test we gathered for a short “movement ” time focusing on our Thanksgiving fingerplays and I told the story tweaking it just a bit ( The little girl being a fairy bringing a beautiful coat and David being a little girl with a dog named Harvey and having big sisters). Then we went in the kitchen to make our own thankful coats. I lead into this lesson earlier in the week by starting The Family Under The Bridge. It amazes me how much more Miss Sky understands the story this year compared to last. We have been talking about it all week and she has volunteered to add this months allowance to the donation next week. Earlier in the day I had printed this fill in story for Miss Sky to work on and to my surprise she was really excited to do it. She even wanted to put on a puppet show. She did a great job. We wrapped up our day with Miss Sky finishing Charlotte’s Web. Oh my we had to pause a moment from all the waterworks to let the story soak in. “It not so much she died mommy but that she was all alone”. Thank goodness we ended the day with a happy ending as I finished The Family Under The Bridge. Thought I would post this weeks calendar of the soul. It has really spoken to me. You can subscribe to it here. Oh man I have been enjoying the seminars from The Waldorf Connection this week. I especially enjoyed the one last night about the four bodies given by Lynn Jericho. When coming to Waldorf education there are a lot of people who don’t quite understand the spiritual science behind the education and it can be very hard to explain it to those who have never experienced it before. I myself have been able to see everything that Mrs. Jericho so wonderfully explained last night. Having children 20 (about to be 21 and out “finding herself”) , 10, and 5 I am very familiar with the changes brought on by the different bodies. I loved her example of breathing in and out rhythms starting with the inhaling at birth and ending with the exhaling at death. I also loved her quote “If you want a happy marriage you must understand each others temperaments” this is SO true, knowing that Papa is melancholic and him understanding I am choleric has saved us many times from heated arguments. He has “come” to understand my need to tell him which lane to get in while driving (even though he has been driving longer than I)and I have “come ” to understand his sensitivity. Lastly her talk about how even though our physical and etheric bodies may be older than our child’s ,our spirits are equal and that they are impacting us just as much as we are impacting them. I seriously could go on and on about this talk and if you missed it I would definitely purchase the download. As far as lessons we are back to our 3 day rhythm of day 1 telling the story, day 2 Miss Sky telling me back the story and drawing a picture from the story, then day 3 summarizing the story in her MLB. Yesterday it was Miss Sky’s turn to tell me the story from Monday. She chose to do a puppet show. Okay she did terrible I think all the big words I used in the story Monday really threw her off. Well I had problems with the story. I am a believer that unless the story lives in me it will not “click” with my child. Yesterday was proof of that. She did however remember Odin creating the worlds with Ymir’s body, blood, hair, teeth, and brains, she had all these details down. I found it interesting she also repeated word for word of what I said about Heimdall, how he is keeper of the rainbow bridge and his sight and sound was so sharp. How his trumpet will announce the last battle between the gods and the forces of evil and bring total destruction of the nine worlds. I look forward to see which gods become her favorites. After her re-telling of the story I went over it again ,this time leaving out all the big words of the worlds and instead just said what they were like a region of fire and a region of icy mist. I could see the light bulb go off and she made her picture in her MLB. Today we summarized the story on the board and she had it down (better than me , I had to look to make sure she was right) and she copied the summary in her MLB. Today , after she wrote her summary,I introduced Odin greatest of all the Norse gods. 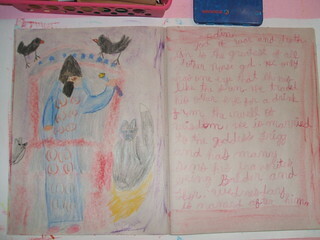 First we listed on the board what she already knew about Odin from the story. Frigg ,his wife, and all his children Balder and Thor being his favorite. Then I told her about his 2 ravens, Thought and Memory, his 2 wolves who go everywhere with him and how he feeds them all his food since he only consumes wine. I also told Miss Sky how he got his one eye and that Wednesday is named after him. 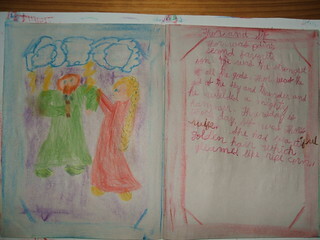 I am doing something different this year instead of me putting a drawing on the board of each god for Miss Sky to copy. We will draw together our own pictures using the descriptions I give. I think it helps for her to have her “own” image of what they look like. Yesterday I gave Miss Sky her vocabulary words and today she finished looking them up in the dictionary and copied the definition in her MLB..
For spelling yesterday she practiced her words by first looking at a word then closing her book and spelling it on paper then looking to see if she was right. 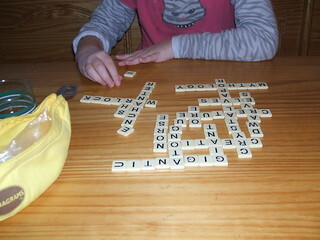 Today she used bananagrams to practice her words. I am slowly handing over the responsibility of Miss Sky doing the majority of her school work on her own for when it’s time for Little Sis to start school. We will always have main lesson together but she can do the rest on her own while I am working with Little Sis’s main lesson. I am giving her more independent reading time besides our read aloud time. I feel there is a big difference in reading quietly and being able to read aloud. These are books of her own choosing ,not school related. She found a series she really likes. Yesterday she practiced her form on her little chalkboard switching between right and left hands then tried it with her eyes closed. Today we practiced the form with our toes on the floor while standing. We finished with reading Miss Sky reading to chapter 19 of Charlotte’s Web and I read to chapter 3 of The Family Under The Bridge by Natalie Savage Carlson. I have decided to start our first Norse Myths block next completely straying from my original plans. Come to think of it the only block I have done according to plan was to start the year off with geography.That is why I don’t care to follow a curriculum because more than likely I wouldn’t use it, that’s just me though. For our first Norse Myths block ,and being that the holidays are swiftly approaching, I thought we would work out of the creation story these next few weeks doing an introduction of all the gods and goddess . This way for our second block I can go right into the stories and hopefully Miss Sky can make the connection of who they are. I think this would also help to have her “companion book” for when we read The Children of Odin at the end of the blocks. So the creation story will be the only one I tell this block. I an using the book Favorite Norse Myths by Mary Pope Osborne and this site . Since we will be talking about the Aesir gods and goddess this block I thought I would keep our focus mostly on Asgard. After our walk we gathered for circle. Fairy Ring (gathering song) I should add that we all take turns ,different days, being the fairy queen (yes me too 🙂 )who gets the wear the crown and a silk cape during circle. The fairy queen stands in the middle and we dance around them in a circle with silks while saying the verse. Twinkle Twinkle Little Star (song) Miss Sky plays along on her penny whistle while we sing. We end circle with Miss Sky’s memory poem November Morning by Evaleen Stein and tongue twisters. 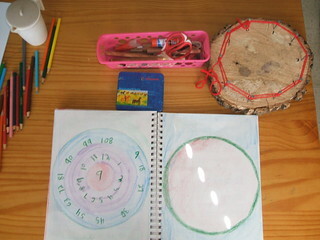 I want to add that circle time should be fun (not serious) to get warmed up for the main lesson. I think it is funny to call it circle time because we rarely are ever in a circle. I think I will start calling it movement time. The Little’s come up with their own movements for verses most of the time, I just keep them centered. For main lesson I gave Miss Sky a new MLB and on the first page we started our table of contents page. 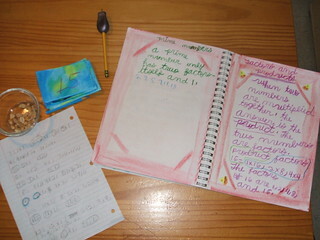 In this MLB she keeps her spelling lists , vocabulary words (and definitions), her form drawings , and spelling tests. For spelling I don’t “grade” her on tests this is more of a check in to see how she is doing. If she gets one wrong I write it correctly on the board and she copies it next to her misspelled word and we move on. I also like to keep records of progress not just for myself but in case I ever need to prove our lessons. 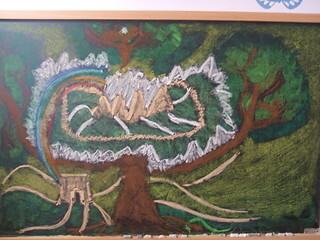 Next I showed her my drawing and told the story of The Creation of The Nine Worlds. I want to be honest here and say I kept my notebook with the pronunciations on my lap in the order they appear from the story (can you say Ginnungagap fast three times ?). Then we moved on to Miss Sky’s spelling words. We marched while spelling each word out. Then we went over the list finding words inside each word. Like cry(stal) , this helps Miss Sky memorize the words faster. She wrote them in her MLB twice , first printing them once then once in cursive. I introduced a “weaving form” for form drawing connecting it to the story of how the two worlds Niflheim and Muspell whirled around in the dark and dismal pit , faster and faster. For reading Miss Sky read to chapter 16 of Charlotte’s Web and I read to 19 of Dorothy and the Wizard in Oz. Wishing everyone a happy Moon day ! Yesterday the Little’s decorated their lanterns as we prepared to meet with a small group of families to help celebrate Martinmas later that evening. We all gathered round the table as Danielle told the story of St. Martin before we broke bread and shared a meal and fellowship with one another. Then we headed out on our lantern walk under the stars. She has the perfect yard (and voice) to do a lantern walk, and we couldn’t have asked for better weather. There was a positive energy in the air and though Papa thinks it was just dust (the only photo from the night that turned out this way) I think I captured it on film. 😉 After our walk, we gathered round the fire for story time. It amazes me how quiet everyone gets (not a peep from any child) during the story, but Danielle is a very talented storyteller. We had a lovely time and enjoyed meeting new friends but as they say, all things must come to an end. Literally :(. I guess turning 10 brings on many changes, changes that this Mama is not ready for (not yet anyway). Well, I knew it was just a matter of time when my little girl would step out spread her wings of adolescence and start to become her own person. Our family does have family movie night about 1 sometimes twice a month where we make homemade pizza (still trying to find a good gluten free crust recipe) and pop popcorn on top of the stove. Our favorites being Mr. Hobbs Takes a Vacation and Summer Magic where Miss Sky fell in love with Hayley Mills. So, of course, I had to share with her one of my favorite movies from childhood. I never thought it would backfire on me. Yep, it ‘s gone. The time has come, my little girl is growing up. All I can do now is hold on and enjoy the ride :). Well, at least she does have good taste. This week wraps up our first math block for fourth grade. During this block I found some things that we most definitely need to work on. I found out Miss Sky has problems writing numbers once we hit 100, 000 and up. She has no problems reading them and has no problems with place value but I soon realized there is a difference between writing and reading numbers. I made a game up using this idea with dice (each color of the rainbow equaling a different place , for example red is units orange is ten and so on)in second grade so I will be bringing the rainbow board back out in our next math block tieing it in with our Norse mythology block. I also made a set of tangrams , out of card stock from Family Math, to practice some geometric shapes. This was a HUGE road block, for Miss Sky anyway(Little Sis loved it). I will be honest and say I had a feeling Miss Sky would have problems with this , that’s why I brought the subject up, because she was very late in being able to put puzzles together (like 8 pieces when she was 5). Little Sis was putting those together at 2 and has since moved on to 50 pieces (all on her own, she just turned 5). I know all children learn different and I do not openly compare my children in any way (these are my homeschooling notes). We each have a special purpose here in this world, Miss Sky has a wonderful ear for music, but there are certain things that all children must master in order to serve that purpose. SO we will be working with these over Christmas break. I introduced factoring and products by first finding the area and shape,using 1 inch square cubes, numbers make. This also paved the way to introducing prime numbers. Miss Sky numbered a large piece of paper 1-25. Then using 1 inch graph paper ,cut up, she made rectangles and or squares using that amount of cubes. For example for the number 4 she could make a square 2×2 and a rectangle 1×4 (1,2,and 4 are all factors of the product 4). She noticed that not all numbers could make 2 shapes. (*Note* in picture 9 only has 1 shape she realized her mistake when we went back over it after picture was taken). Day 2 I cut up 50 cards ,using old water-color paintings, and numbered them 1-50 (these are the product). Then using whole to parts Miss Sky wrote the factors of each number on a piece of paper. For example 12=1×12, 6×2, 4×3, The factors of 12 are 1,2,3,4,6,and 12. Next I explained that a prime number only has 2 factors 1 (not prime) and itself and she went back over her paper and circled all the prime numbers and made a page in her MLB. Miss Sky also learned her 9 times table and I filled them in on the board. . This will also be our last week for grammar until our next math block. Now that Miss Sky has mastered nouns, pronouns, verbs, adjectives, and adverbs, and knows that a sentence is a thought that starts with a capital letter and ends with a punctuation mark (period, exclamation mark, or question mark). I explained what subject and predicate is. 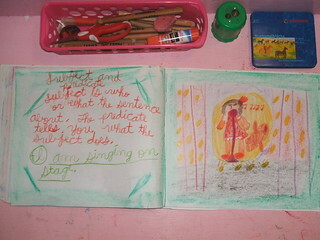 For starters I had her draw a picture of herself doing anything she wanted in her grammar MLB. 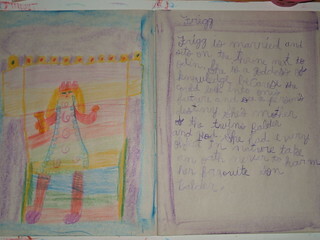 Then while looking at her picture I had her come up with a summary explaining what she was doing in the picture. I wrote her sentences on the board. For example I am singing on stage. I explained that “I” is the subject and “am singing on stage”, is the predicate. I had her come up with more sentences and Miss Sky circled the subject and underlined the predicate. We will continue reviewing grammar during our language arts blocks , just not introducing anything new. For reading Miss Sky is on chapter 14 of Charlotte’s Web and I am on chapter 17 of Dorothy and the Wizard in Oz. *As A side note* I am sure all of you are aware of Ancient Hearth’s lovely blog but just in case you have not seen this post I wanted to bring it to your attention. The Little’s (and myself 🙂 ) love Christine Natale’s stories that she has SO generously shared with us freely. Now we can do something to show her just how thankful we are ,by voting for one of Christine’s stories she has entered in a writing contest. You can vote here. Wishing everyone a wonderful Veterans day as well as Martinmas ! Martinmas has become my favorite festival ,outside from celebrating traditional holidays, there is SO much more than what meets the eye. I thought I would post a few ideas for this weeks celebrations. Here are some links I posted from last year. 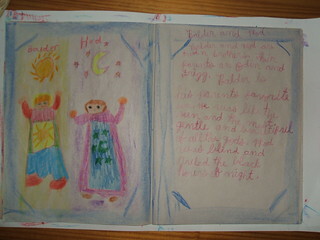 Here is the beautiful story I share with The Little’s before we make our lanterns. Miss Sky and I are also working on the lovely Saint Martin song ,Marsha Johnson wrote, with our penny whistles (the song can be found by searching the Waldorf Home Educators yahoo group files # 18825). I have dreams of doing many things to help the homeless but right now, having young children and not wanting to expose them to the horrible truth, the time just isn’t right. So as a family we find other ways we can help do our part. For starters we have a local bakery that takes donations such as hats, blankets, scarves, and mittens and delivers them to the homeless around our area. Supporting her bakery also helps because she takes food to them as well. We also have several soup kitchens, and shelters that are always in need of help too. For this years family project we have brought back the blessing jar but this time, starting this week till the week of Thanksgiving, we will be exchanging the gems for money to donate to our local soup kitchen. We have SO much to be thankful for everyday and it could very well have been our family that was in need of help this year when Papa lost his job. We will also start reading The Family Under The Bridge again by Natalie Savage Carlson once we finish up our OZ book. Other ideas we have this week are to bake cookies to share with our neighbors. Living in such a high-tech world it is nice to unplug for a while and have a “real” talk with friends over tea (and cookies :)). I hope some of these ideas can be of use to help get those creative juices flowing and I would love to hear what your family is doing this year for Martinmas. Wishing you all much love and light as we prepare to enter into a season of darkness.